I’ve uploaded a new video. The initial scenario in the demo will take place around a Neptune class planet (about 20 times the mass of Earth – approximate radius of 25,000 km) with an extensive ring system. The system star is now much closer to what it should look like – white (our sun is yellow to our eyes because of the atmosphere – it looks white in space) and with a smaller apparent size than we see from earth. I’ve updated the HUD to give me more screen real estate – the indicators on the top left and right are live. Your suit HUD will show you remaining deltaV, maneuvering propellant (attitude thrusters), life support, and power remaining. Most of my work over the last few weeks has been dealing with scale issues in Unity3d. Several other developers have written about this (Dave Newson, Sean O’Neil, etc). 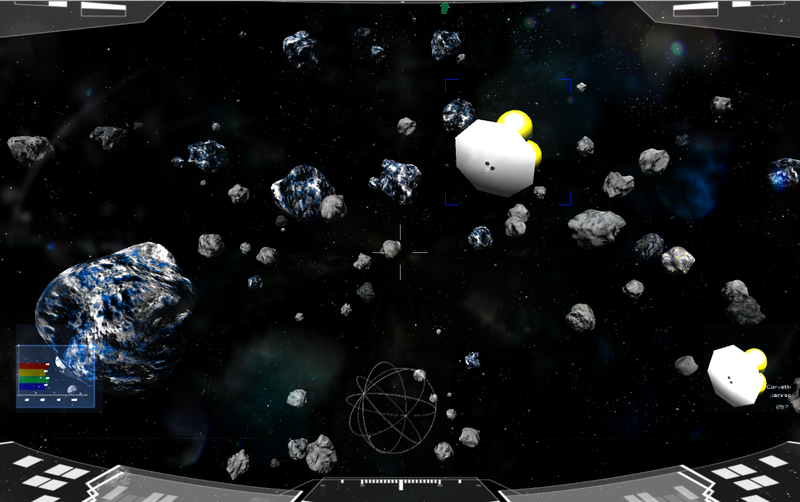 The basic problem is that Unity3d uses floating point variables for object placement and physics and that doesn’t give me enough accuracy to model a scene that could be 500,000 kilometers across or more, with scales that need to handle a person in a suit (2 meters) to a very large spaceship (500 meters) or asteroid (5 km) simultaneously. What I’ve done is write my own basic extension to the Unity3d transform and rigidbody module that uses double precision variables. I’ve also incorporated some of Sean O’Neil’s ideas for handling the display of large distant objects (like planets) that are past the Unity3d camera far clipping plane (I’ll probably post a more detailed explanation of this with code on my product7 blog in the next few days). 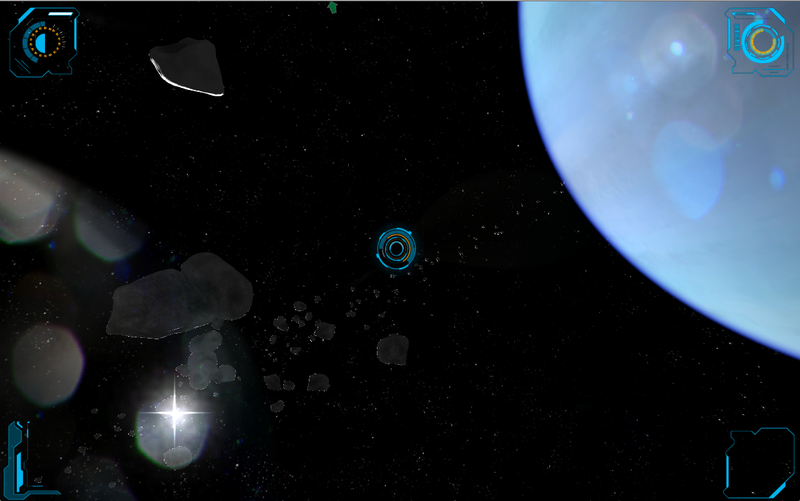 Units in Unity are arbitrary, in the demo I’m using one unit = 1 kilometer – so in render space the the demo the player camera starts about 40,000 kilometers from the planet within the first ring system. The demo and video have not been reconciled with realistic physics yet, the movement from thrusters is definitely overpowered at this point for example. 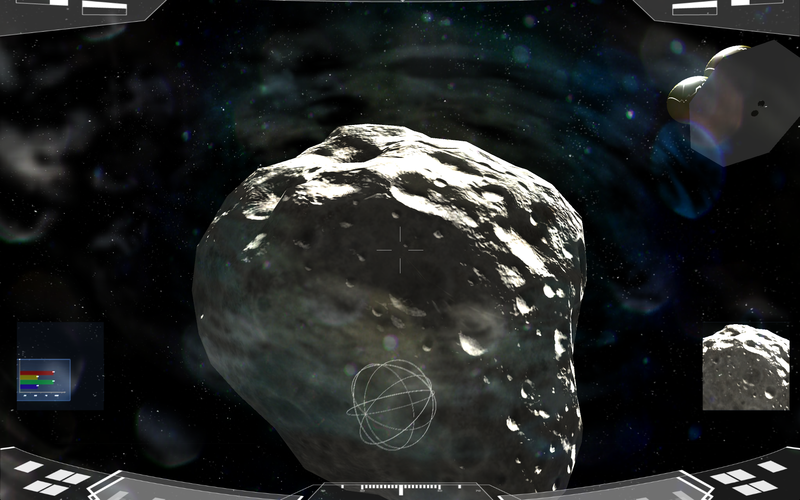 Nice asteroid from Unity3d Asset Store. Great discussion on the forum about what space should look like – good points all – so I’ve dropped the ‘fancy’ stuff – no nebula, whirling galaxies, or pink gas clouds. Visual style is hard shadows, reflective surfaces in sunlight ‘wash-out’ the stars. As you can tell from the earlier videos movement in your suit was pretty ponderous. I was basing this on other spacesuit simulators and what I’ve seen on videos of actual spacewalks. After a lot of internal testing, frustration, and additional research I’ve changed the control scheme. Attitude change is much faster, you still have inertia and mass but you can change orientation in pitch, roll, and yaw relatively quickly. These changes are done with a single-gimbal control moment gyroscope mounted in your MMU. The gyroscope approach can produce a lot of torque for small power amounts and doesn’t waste precious reaction mass. I’ve posted a video of the new control scheme – mouse for orientation (left/right yaw, up/down pitch, left/right with right mouse down for roll) and wasd keys for thrust forward/port/starboard/aft. 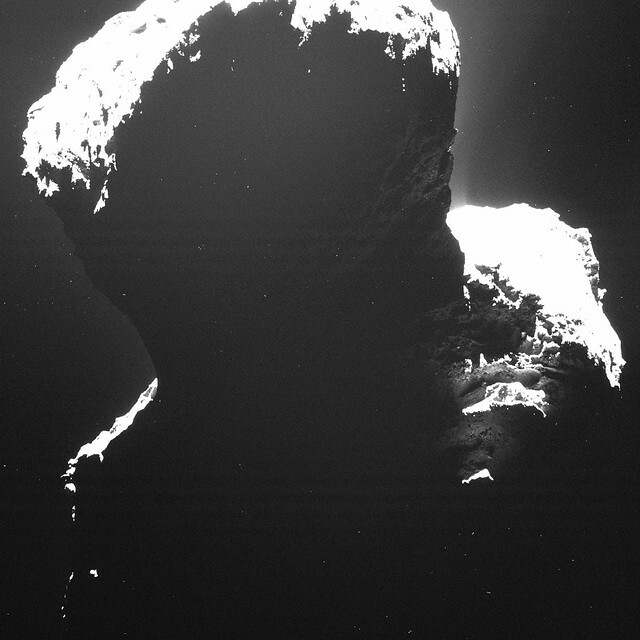 I believe this is approach more accurately reflects the future maneuverability of spacesuits and combat spacecraft. Ships will be able to change facing and orientation very quickly to unmask weapons or to use armored or less vulnerable sections of the ship to absorb incoming damage. Of course changing orientation does not affect your velocity vector – changing that will always take time and reaction mass. I’m a week or two from releasing the first technical demo to early access members, with the first public demo to go out in late November. These demos will not have a lot of ‘game’ in them – they will mainly serve to introduce the initial control scheme and look and feel of TorchShips.